The author of Curious Math, Clay Ford, enjoys mathematics. 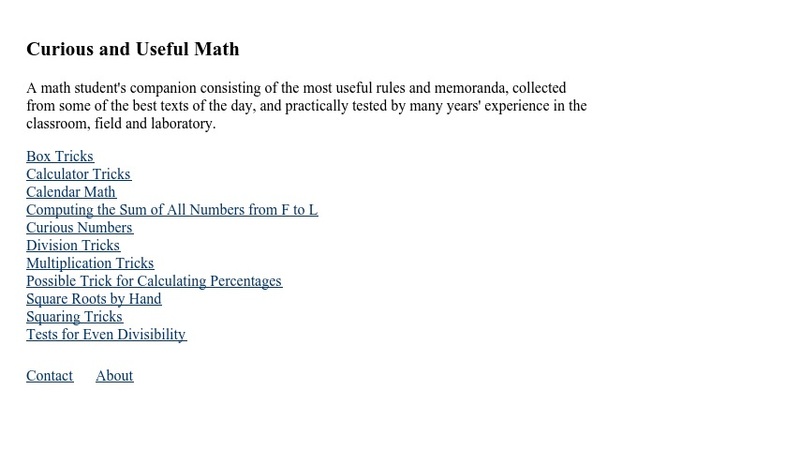 While Ford claims not to be an expert by any means he maintains a fun website full of math tricks and trivia. Examples of postings include how to \"quickly square a number that ends in 5\" and \"why the number 153 in the Bible is such an interesting number.\" Visitors can search a particular subject or browse the Math Topics, which are categorized as Facts, Trivia & Fun, News & Updates, or Tricks, Rules & Methods. The articles are also organized by Top 10 most read, most commented, and most active new submitters. This site will be useful for both students and instructors in early post secondary and developmental math. Registered users can post comments to the entry, submit a math article on tricks and trivia, contact other users, or join the discussion forum. Registration is free.